In its most recent September issue, Vogue offers a futuristic vision of fashion that blurs the line between gadget and accessory. 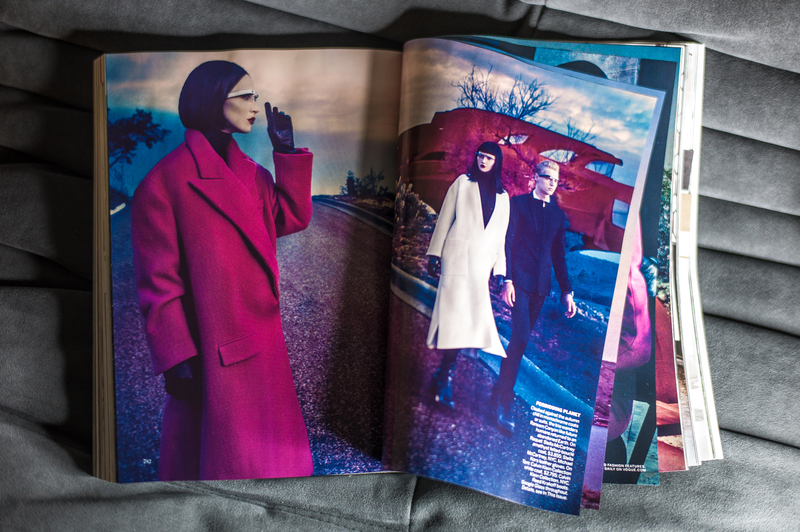 A 12-page spread titled “The Final Frontier” features models wearing Oscar de la Renta and Gucci, gazing out over a space age landscape, taking in the view through the lenses of Google Glass. The subtle details of the shoot’s art direction — a hand resting on the Glass frames, the light reflecting off the lens, a shot as if the camera were wearing Glass — suggest that these glasses are the future. 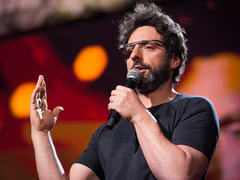 Sergey Brin: Why Google Glass? 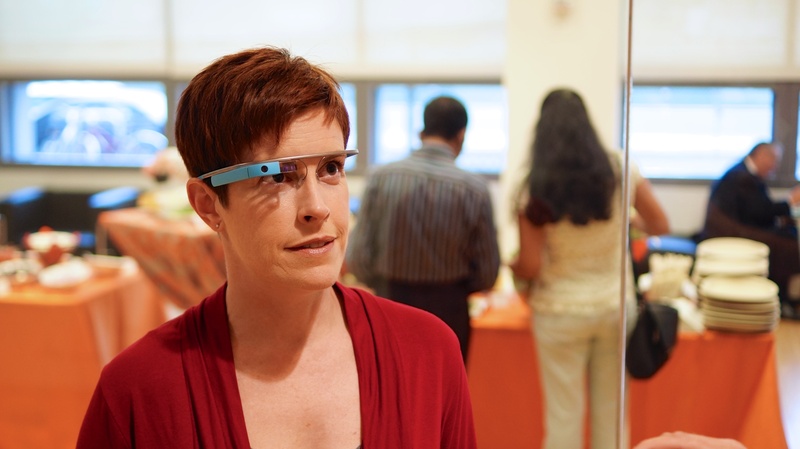 Glass, the wearable computer that Google’s Sergey Brin shared at TED2013, is the first mainstream electronic device to be worn and operated on your face. Following in the footsteps of eyeglasses and wristwatches, Glass just might be the next revolution in wearable technology. Glass’ developers knew that no mater how functional the gadget, it would be useful only if people wanted to wear it and it was considered “cool” to wear in public. (To that end, perhaps it helps that TED attendee Chris Kluwe, the kicker for Oakland, wore Glass at a practice last month.) “If it doesn’t meet a minimum bar for comfort and style, it just doesn’t matter what it will do,” Steve Lee, who was involved in the development of Glass, told The New York Times last month. This is where fashion design comes in. Google recruited Swedish designer Isabelle Olsson to streamline and stylize the device, which in prototypes was bulky and awkward. In fact, the earliest versions included chopsticks, fishing line and coat hangers — as Google’s Tom Chi explained in a talk at last year’s TEDYouth. The “nose-born weight” was too much to bear, and the plastic white frames made with a 3-D printer were cumbersome, especially with a cell phone taped to their side. The slick frames are now available in five colors — charcoal, tangerine, shale, cotton and sky — and have been streamlined to the bare bones minimum, channeling Japanese design. Google’s target clientele is the general public, but it doesn’t hurt to have fashion heavyweights like Diane von Furstenberg as endorsers. Von Furstenberg incorporated Glass into her show at New York Fashion Week last year and has been a strong advocate of the frames. As she told The New York Times, accessories “tell someone that extra bit about you, and I think to wear Glass is to show that you are engaged, you are current, you are open to new things.” In other words: Glass can be a fashion statement. But the current Glass frames have also been called a fashion faux pas. They have been criticized for looking dorky and futuristic, — a “Segway for your face,” as writer Matt Novak put it. The blog “White Men Wearing Google Glass” wryly pokes fun at both the frame’s style and the tech industry’s white male dominance. A recent Saturday Night Live sketch highlights the awkward functionality of the gadget, and paints a portrait of how the device is viewed in some circles. The team at Glass has acknowledged some of the negative feedback it has received, and other frame designs seem to be in the works. Olsson recently posted a photo on her Google+ page of a more conventional glasses frame that incorporates Glass while steering away from the sci-fi look. Google is also considering partnering with Ray-Ban or Warby Parker to design additional frame styles. In some respects, Glass is simply the newest innovation in performance-enhancing wearable technology. We’ve grown accustomed to calculator watches, hearing aids, and Nike+iPod armbands. But Glass could be a game-changer, as it ventures to make an electronic device fashionable and allows unprecedented access to information with the blink of an eye.